Keep your business phone system within your business walls. The traditional on premise PBX system has the PBX box and the actual phones all working as a system in your business premises. The PBX is handling all functions of the system including voicemail, auto attendant, call transfers, paging, call holding, intercom and more. The system is connected to the telephone company lines to allow incoming and outgoing phone calls. The PBX can be connected via a wide range of telephone lines including standard PSTN lines, digital PRI trunk, or even VoIP (SIP Trunks) lines over the Internet. You purchase the entire system as a capital investment while paying the phone company or SIP Trunk provider for monthly service and the cost of your calling plan. Need not be dependent on the Internet at all. Full featured and easy to use equipment. Simple call holding and retrieving, transferring, and intercom functions are all included. The phones can be fully digital and not involve connection to your network in anyway. 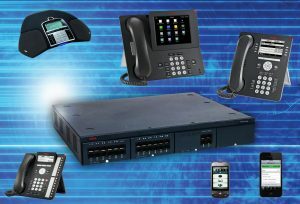 The phones can be IP telephones and provide all features but operate through your network. Connection to the phone company can be choice of standard lines, digital PRI, or VoIP (SIP Trunks) or a combination of these. Features such as warehouse paging and door intercom are easy to incorporate. After equipment investment, long term costs for monthly service should be lower. Add more phones and extensions without increasing monthly costs. Like other technologies, on-premises PBXs are proven and over the long term can be more cost efficient, especially if the business using the PBX has no need for newer features and capabilities and possesses the skills or has a trusted partner to take care of the PBX. Is your system on premises? If so, do you plan to keep and maintain it or move it to cloud?